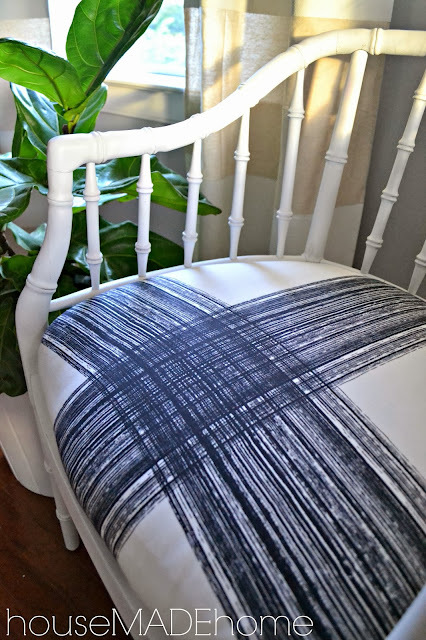 If you follow me on Instagram, you know that I've been trying to find just the right fabric for my bamboo cane chair that matches our style. I found this fabric which by the way was just $1 at the U-Fab outlet, but it wasn't quite right for our space. Hopefully I will find it a good home. On a previous trip to U-Fab I had my eye on this fabric, but I passed it by! Luckily no one had snagged it up before I made it back. 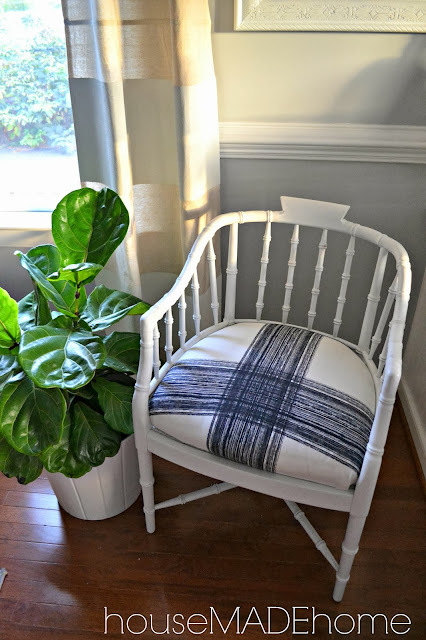 When purchasing the fabric I noticed some small stains on the far side of the fabric (which would be cut off in the upholstering process anyway), that I ended up getting the yard for $2.49 versus the $7.99 outlet price...SCORE! You know I love a good deal! 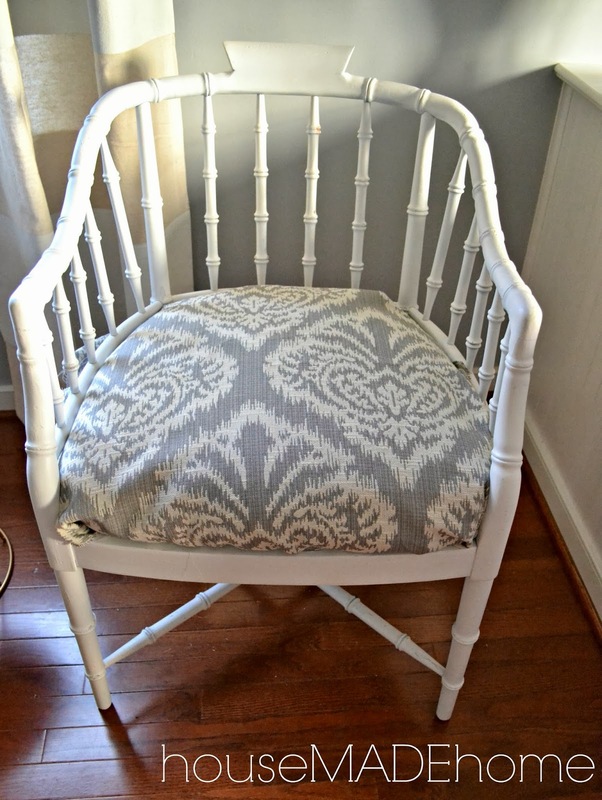 The original fabric was so outdated, even though it looks so cute in the picture. 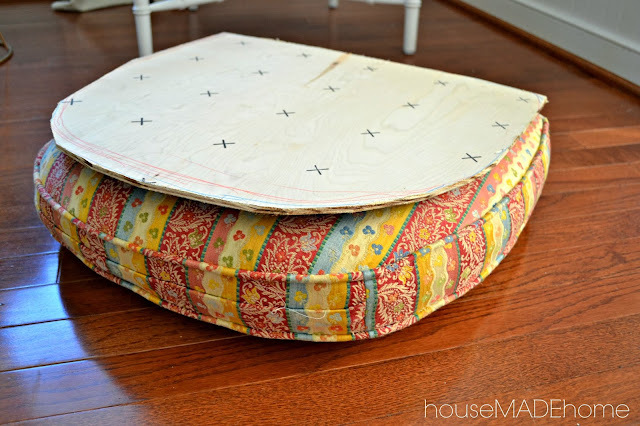 I had my husband cut out a piece of plywood in a similar shape of the cushion, but slightly smaller so I had something to staple the fabric to. We then laid out the fabric over the cushion to decide exactly how we wanted the pattern to appear on the chair. 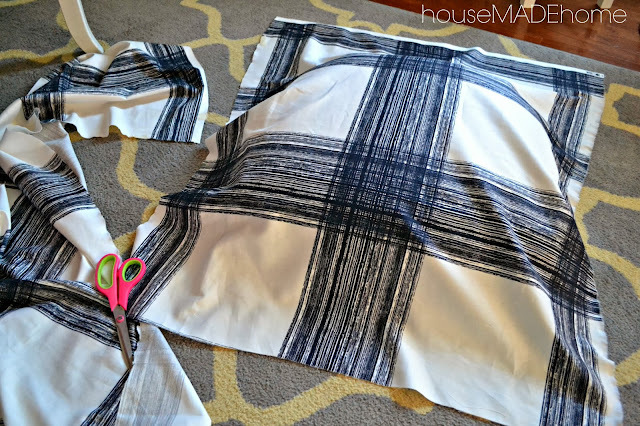 We flipped the cushion over holding the fabric in place to get an idea of how much fabric we needed to cut off. We didn't want to have any bulk under the chair. 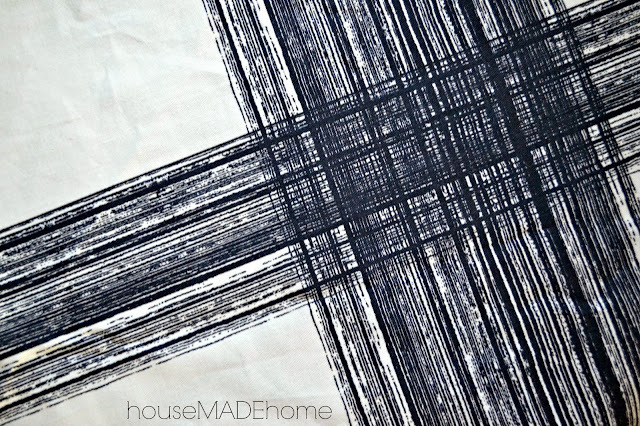 When stapling the fabric we started on the sides and put in a few staples. 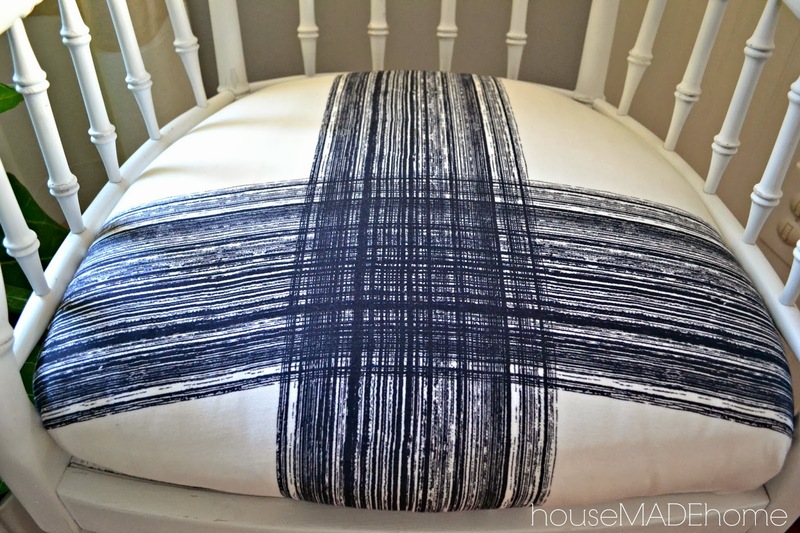 We then repeated the same thing on the front and backside of the cushion. Sorry that we didn't get any pictures of this ( I had to hold down the fabric while my husband stapled). After all sides were complete, we were just left with the corners. We flipped it over to the front to make sure that the pattern was right before we finished the corners off. This was a little tricky! I wanted to make sure that both sides looked identical...well as much as I could anyway! I love how the chair turned out! I looks much less formal than my first fabric choice and matches our style perfectly. 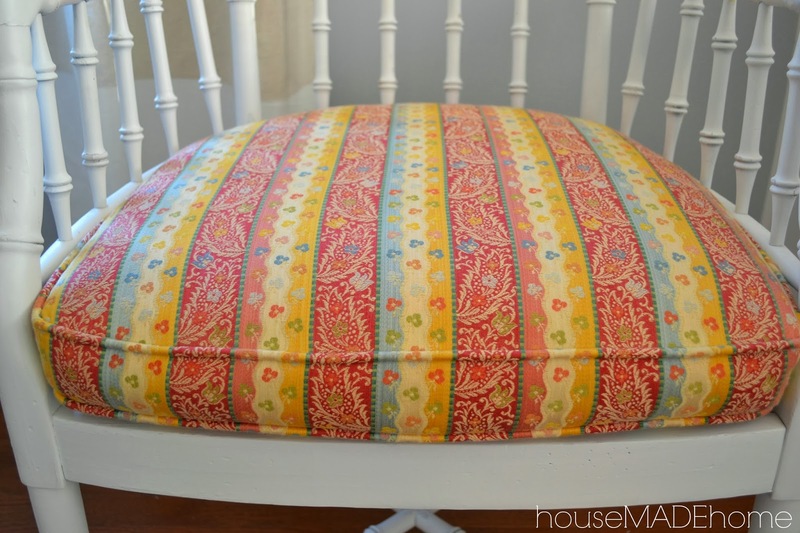 Have you upholstered any projects lately? Thinking about giving something a fresh new look? What do you have in mind? I'd love to know. Very clever and crafty! Love those trash to treasure finds! I popped over from the Whimsey Wednesday Linkey. Thanks for posting there! Come visit me sometime! Deb @ Kneaded Creations. What a fabulous looking chair Tyesha! Wish you would've found two. I'm looking for something similar. Love the fabric choice too. I'm featuring this at tomorrow's Thriving on Thursday Linky Party. Thanks so much for linking up. I wish I would have too! Thanks for the feature! 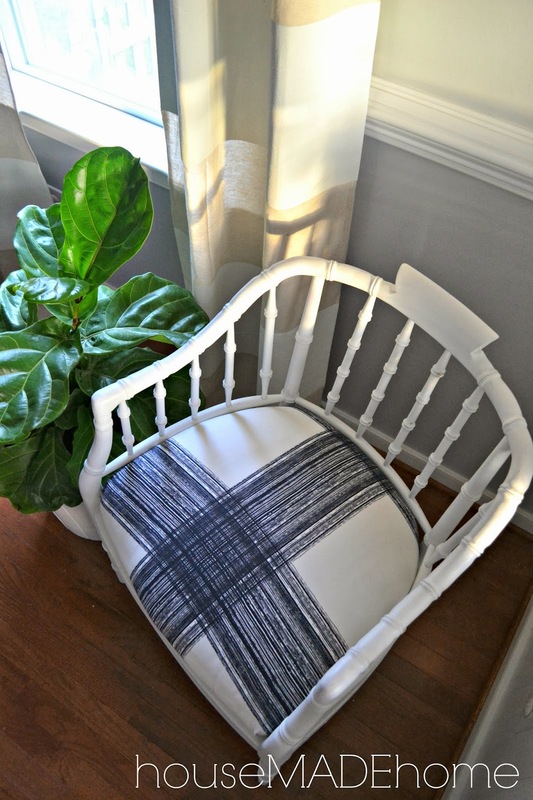 Love the chair and the fabric your chose! Wow, what a cute makeover and I love that fabric. Any idea on the source? I have no idea on the source...I will have to find this one out for you! I'm loving how crisp and clean this looks after your redo. 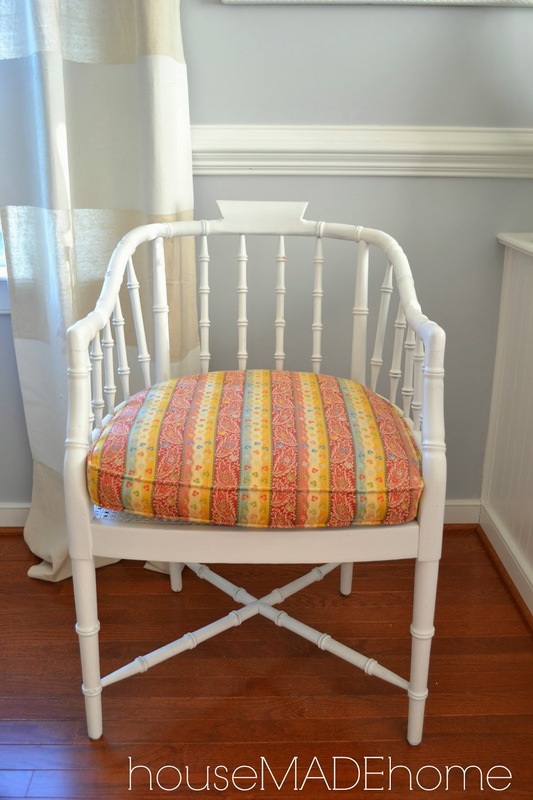 I've pinned it to my "Plain Furniture Isn't For Me" Board. Thanks for sharing it at the Pinworthy Project Party! Thanks for stopping and pinning this makeover PJ! That is a great looking chair! I am pinning!